Get a $10 Free Calling Card Bonus When You Sign Up for Your Pingo International Calling Plan Today! That’s up to hundreds of minutes in free calls to friends and family! 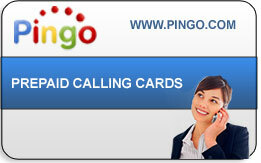 Pingo’s International Calling Plans are Reliable, Affordable and Easy to Use. And all International Calling Plans Come with Exceptional Customer Support and no Hidden Fees. Talk to Loved Ones More Often with Pingo International Calling Plans! Pingo Provides Easy-to-Use, High-quality International Long Distance Phone Service with the Same Great Service as its International Calling Cards.